Image alt text (alternative text) is used within the HTML of a website to describe an image, principally for web accessibility (for blind and visually impaired) or if the image cannot be displayed for some reason, as the text will appear in place of the image. It’s also used to by search engines to understand the content of the image. Image alt attributes (often referred to incorrectly as ‘alt tags’) should specify relevant and descriptive alternative text about the purpose of an image and appear in the source of the HTML like the below example. The alt attribute itself and/or the alt text are often forgotten entirely and tracking them down can be a labourious task without automated tools. 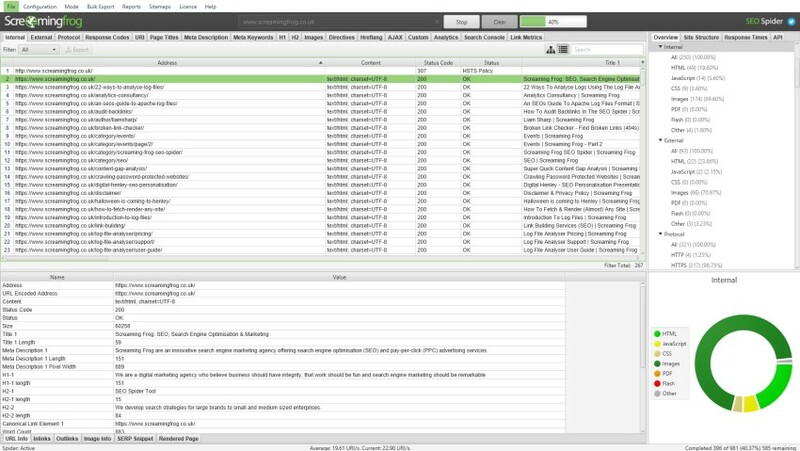 You can use the Screaming Frog SEO Spider tool for free (and paid) to view your image alt text and find missing alt attributes and alt text on your website. Below is a very quick and easy tutorial on how to check alt text of images, find missing alt text or tags, large images and bulk export them. First of all, you’ll need to download the Screaming Frog SEO Spider which is free in lite form, for crawling up to 500 URLs. The next steps to view and discover missing alt text are as follows. Next up, click on the ‘images’ tab, where you will see the URLs of all images discovered during the crawl, the size of the image, and the number of source IMG inlinks. The ‘image info’ tab at the bottom of the SEO Spider will populate the lower window pane with information on the source pages that reference the image (the ‘from’ URL) and the alt text of every image element discovered. 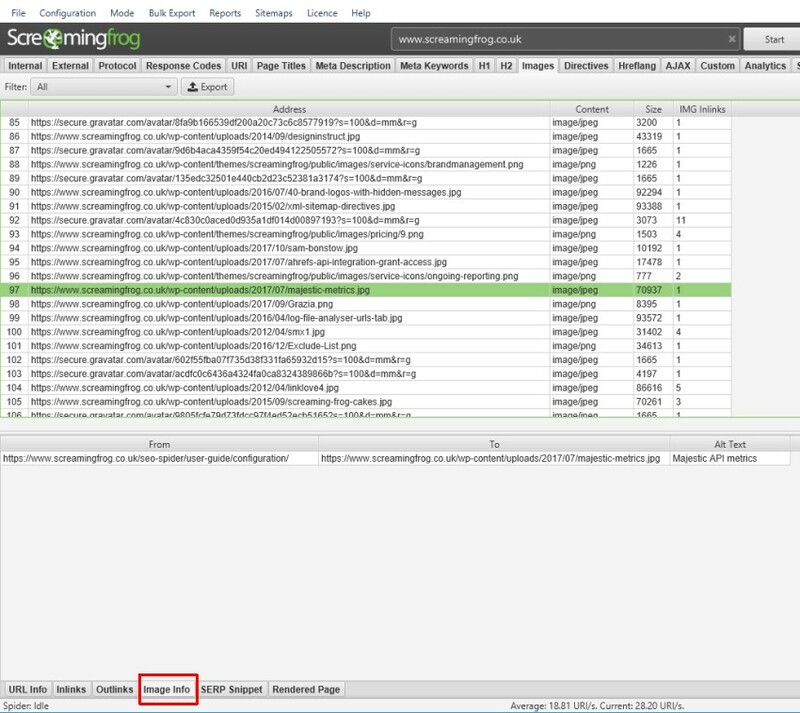 In the example above, you can see that our user guide configuration page (https://www.screamingfrog.co.uk/seo-spider/user-guide/configuration/) has an image about Majestic Metrics (https://www.screamingfrog.co.uk/wp-content/uploads/2017/07/majestic-metrics.jpg) with the alt text ‘Majestic API metrics’. Images can conceivably have many different URLs referencing them, and hence, many different alt texts as well. While many CMS set a single alt text for any image, it’s actually set in the HTML within the IMG element and alt attribute, which like anchor text of a link, can be very different. Hence, image alt text cannot be simply set in a single column next to an image and this is why our multi window approach allows users to review every alt text for consistency. The filters will refine the URLs within the ‘Images’ tab to only display images which have ‘missing alt text’, are particularly large and ‘over 100kb’ in size, or if they have rather long ‘alt text over 100 characters’ for example. The ‘Missing Alt Text’ filter will include images that either don’t have an alt attribute at all, or the alt text is blank. You can simply use the ‘export’ button on the ‘Images’ tab with the filter set to ‘Missing Alt Text’ to just export that view of the images only. However, if you want to bulk export all source pages that reference images that are missing alt text (and the blank alt text columns) then use the bulk export menu. This will allow you to see source pages, the image URL and alt text. This bulk export will include all source pages referencing images and their respective alt text (including those which are missing). Occasionally you may find that some images on a website are not discovered, and there are two common reasons for this. The images are blocked by robots.txt. You can either ignore robots.txt or customise the robots.txt to allow crawling. Hopefully the above guide helps illustrate how to use the SEO Spider tool to check for missing alt text efficiently.